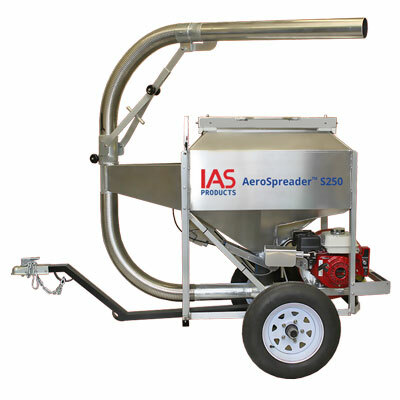 The AeroSpreader™ S250 is a mid-range sized mobile dry pellet feed broadcaster designed to handle 2.0 to 9.0 mm extruded feed pellets using a 6.5 hp Honda® motor direct driving an Aerite™ AB135 model blower. The 250 kg/550 lb capacity marine aluminum hopper is specifically sized to match feed hopper capacity with feed broadcast rates for larger site operations. This optimum hopper to blower matching minimizes repetitive stop and reload scenarios that would occur if either the smaller AeroSpreader™ S80 or S125 models is selected. 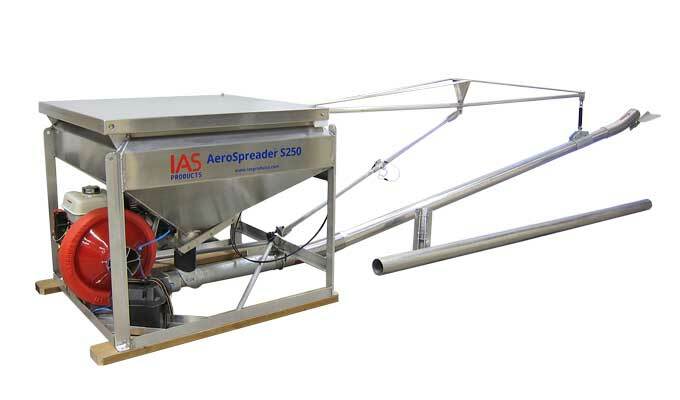 The AeroSpreader™ S250 is considered the smallest practical feed hopper size from which to mount a broad number of feed controls and feed pellet broadcast component options. The Aerite™ AB135 model blower’s 10.2 cm/4-inch outlet diameter and feed broadcast assembly are well matched to the AeroSpreader™ feed broadcaster to handle the feed pellet sizes and densities most commonly used in prawn farming. 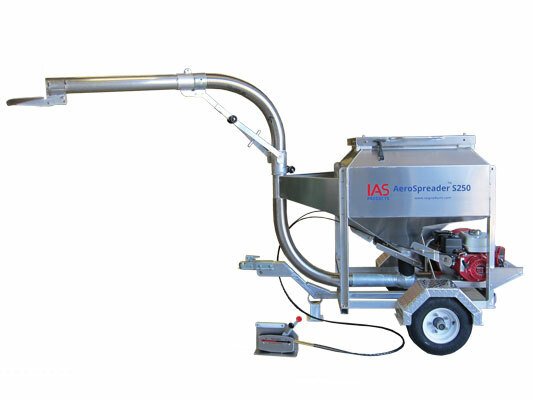 AeroSpreader™ S250 model feed broadcasters are matched with a reliable 6.5 hp Honda® motor (optional electric motor available) that direct drives an Aerite™ AB135 model blower providing the energy necessary to broadcast feed pellets from 2.0 mm to 9.0 mm through a 4-inch diameter stainless steel flex hose. The handheld broadcast hose offers full operator feed control of feed pellet placement as needed to minimize fish feed competition and ensure maximum growth. This model of dry pellet feed broadcaster is manufactured in a range of platform configurations to address site feed loading methods, truck, trailer or boat design characteristics, or for more traditional mobile walkway and stationary dock positioning. 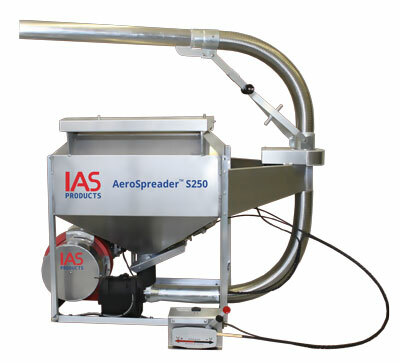 The AeroSpreader™ S250 is available with optional remote cable controls for blower speed, feed gate control, as well as a range of feed broadcast hose configurations from the self-supporting 360-degree manually aimed Periscope Feed Head™ to 6-meter/20 foot feed broadcast booms and feed disbursement tips. 37.5 kg. maximum (82.6 lbs.) per minute for 9mm feed pellets. Note that feed delivery rates increase as feed pellet sizes decrease.